Nike Up and Down – This is the first perfume that made me grasp the reason behind people splurging on perfumes. This aqua scent is hands-down the best I have ever tried and yet, it is not as costly as other great perfumes. Forest Essentials Nargis – This is a new discovery and my absolute favorite. Lasts almost the entire day and I am now travelling with this. More on the Nargis review post. 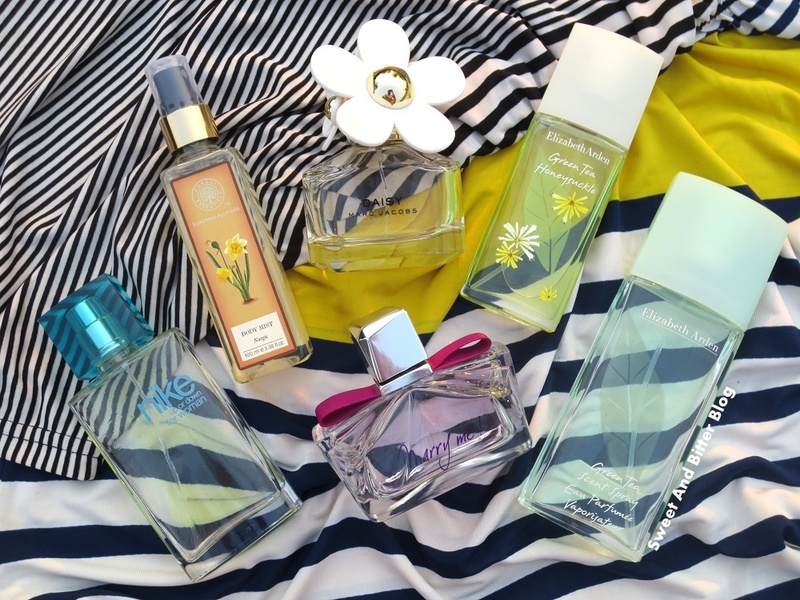 Marc Jacobs Daisy – I picked it from Delhi Duty-Free. I just wanted to own the white flower cap. I paid no attention to the fragrance while purchase because I had no time to check how it evolves on me. In fact, I liked the summer variant more, but I thought that I will regret if I do not buy this. So, I just picked it. Interestingly, I agree why people praise this sophisticated fresh floral fragrance. It does not last long. Elizabeth Arden Green Tea – Another perfume that I have for a long time. It is beautiful – clean and green. When a non-tea drinker appreciates a perfume that smells like green tea, then it means a lot. EA Green Tea is the benchmark for every green tea fragrance. If you like green tea then you might also like another green tea range that I adore - TBS Fuji Green Tea. Elizabeth Arden Green Tea Honeysuckle – EA Green Tea is such a famous range that they introduced several variations of the light fragrance – cherry blossom, lavender (my friend have this, and I loved it), honeysuckle, bamboo, cucumber, jasmine, nectarine, and many others. I got Honeysuckle because I had some shopping vouchers that were about to expire and EA Honeysuckle was the only one available in smaller size. Nevertheless, I love the floral twist to the iconic green tea fragrance. Lanvin Marry Me – The only problem with the last three I just mentioned above – low longevity. But, Lanvin Marry Me is a prince on its own. 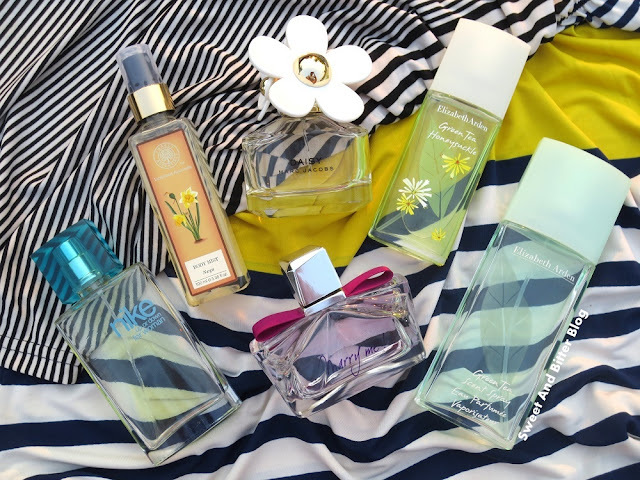 I can very well make this long-lasting citrus, floral fragrance my signature scent. More in the Marry Me review post. 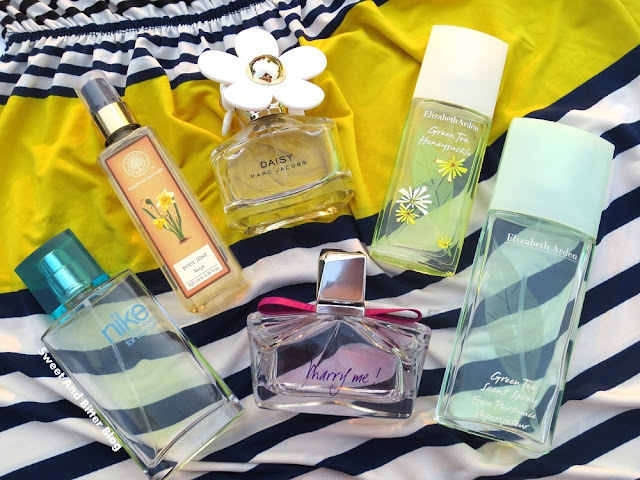 Which is your favorite summer perfume?